Tonight marks the appearance of the brightest supermoon to grace the sky since 1948, appearing 30% brighter and 14% bigger than the usual glowing orb. The moon will not be this close again until November 2034. Given this, and assuming the sky remains clear enough tonight to catch a glimpse, here’s one of several Raspberry Pi-powered astrophotography projects to get your creative senses tingling. 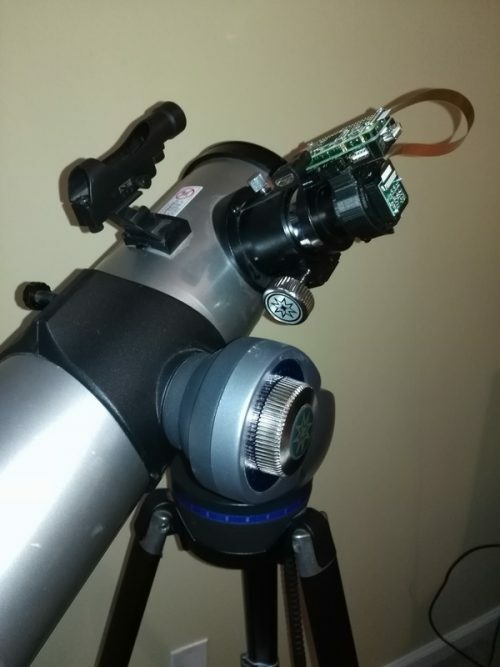 Having already created a similar project with a Nokia Lumia, TJ “Lifetime tinkerer” Emsley decided to try attaching a Raspberry Pi and Camera Module to a newly adopted Tasco 45X refractor telescope. They added a $10 USB shield, wireless NIC, and the usual setup components, and the project was underway. TJ designed and 3D-printed a mount and bracket; the files are available on Thingiverse for those interested in building their own. The two-part design allows for use with various telescopes, thanks to an adjustable eyepiece adapter. A Pi Zero fits onto the bracket, the Pi camera snug to the eyepiece, and the build is ready. The Pi runs code written by TJ, allowing for image preview and exposure adjustments. You can choose between video and still images, and you can trigger the camera via a keyboard; this way, you don’t unsettle the camera to capture an image by having to touch the adapter in any way. TJ will eventually be uploading the project to GitHub, but a short search will help you to build your own camera code (start here), so why not share your astrophotography with us in the comments below? I have a challenge for all the internet extroverts (who make me laugh and make life funnier). This is very cool :) shame i don’t have my old telescope anymore or maybe its in my parents loft….. Note that it’s a “Tasco” refractor, not a “Tesco” one like the article states! Proofing error – thanks for the spot! Note that it ain’t a refractor at all, but rather a small newton reflector. “14% bigger” – well, it’s still only the difference between a 5p coin and a 1p coin, held at arm’s length. So, don’t worry about not being able to fet things going for tonight – and don’t hang about waiting until 2034. If you get it built, then get out and try it *any* time you have a clear view of the moon. In fact, “30%” brighter” also just means 30% more difficult to image in the first place – simply because the moon is so bright in the first place. You will actually get a far more satisfying image if you go out imaging *between* full moons. The details you will see from the edges of craters, and the shadows from Lunar mountain ranges are simply stunning. “I don’t know who first called it a supermoon,” he told StarTalk radio. It’s nothing more than hype … and probably clouded-out hype to boot ! I’m all for encouraging astronomy, but please … do it for something you’d notice ! Be fair – it would have to be a 17″ pizza – and I spend my time in Tesco’s looking for the “Buy 3, get one free” offers. Hype it may be, but only a sort of Tesco Value hype. I’m quite happy to know that we had a rare astrological event happening with the orbit being so close, and to witness it. Just like the transit events, and the minimal eclipses. If you are interested in astronomy then this is interesting. I wouldn’t be supercilious and dismissive. Are you sure you mean a “rare astrological event”? The odds against that being correct are astronomically large. 100% cloud cover here all evening. I believe that the scope is actually a Tasco 4.5″ reflector. The main optic (a mirror) is 4.5 inches in diameter and is known as a Newtonian telescope. Many thanks to a well known Mr. Isaac Newton who is credited for inventing it. Has anyone built a Pi-based telescope mount? I’m sure I’ve seen something along those lines that tracked stars using Stellarium – can’t find the project I was thinking about at the moment, though. I’ll have a more thorough search later on! I would like to take a very long exposure but the camera module max time exposure are 6 seconds. Is there a way to extend this time? The pi V2 camera can do 10 seconds. 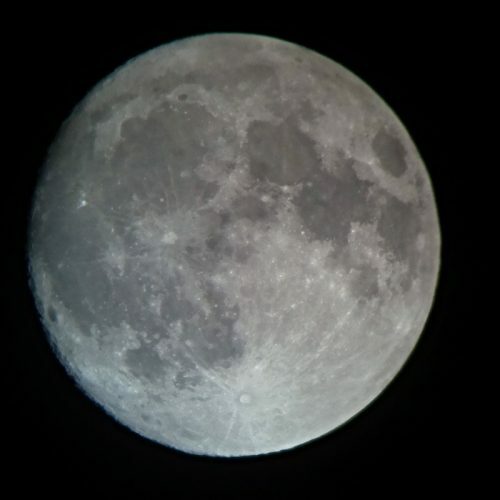 The image below was taken with a pi camera on a 4″ Newtonian scope. Quality isn’t that good… I can do better pictures with my Nexus 5 and cheap lens from China. Are the files up on GitHub yet? getting ready to set this up, but will be using a Pi3 and noIR camera. I want to live stream from my 12inch LX200. hopefully we can see some shots of the great orion nebula. We will at least be able to see the planets and the moon. Should be fun trying. Dave's been at it again: here's how the new Zero with camera performs at altitude.